WILLIAM BRITT was born around 1760-1, in the early years of George III. If he has been correctly identified in the 1851 census, then his birthplace was Mayfield, near Crowborough in East Sussex. His parents have not been found yet. There was a baptism for William Britt on 9 Sep 1759 in Ninfield in Sussex, 10 miles south of Ticehurst, where William married. He was the son of Samuel and Mary Britt. Mayfield has many fine black and white houses, and raised pavements of red brick. The church is St Dunstan’s. Legend says that the village is the place where the saint was working as a blacksmith when the Devil approached him in the guise of a beautiful woman. Dunstan spotted the cloven hoofs under his skirt and grabbed the Devil’s nose with his red-hot pincers. William became an agricultural labourer. He moved several times. At the time of his marriage he was said to be of Buxted, 6 miles SW of Mayfield. Buxted lies in the High Weald area, between the North and South Downs. JANE TICEHURST. Jane’s baptism has not been found. She was living in Ticehurst at the time of her marriage in 1791, but was not baptised there. If she has been correctly identified in the 1851 census, then she was born in Croydon, but there is no confirmation of that. Ticehurst is not only the name of a village, but a common surname in that area. William Britt of Buxted and Jane Ticehurst were married by Banns in Ticehurst on 4 April 1791. William was 10 years older than Jane. They had three children baptised in Ticehurst. We know that Elizabeth moved to Deal in Kent, and it seems likely that William and Jane did too. Presumably the move took place before the children were grown up and married. Since Elizabeth was married in Deal in 1822, the move must have taken place between 1797 and 1822. It is possible that other children were born after 1797, either in Deal or elsewhere. In Hernhill, North Kent, we have the baptisms of children for William and Jane Brett. Deal baptisms for a couple William and Jane begin in 1810. 1813 at Deal St George Sarah. The family were living at West Street, Lower Deal. This William Brett was a poulterer. St George was a chapel of ease for the lower part of Deal. Sarah’s baptism was transcribed into the register of the parish church of Deal St Leonards. These baptisms form a plausible sequence, but cover a wide area. 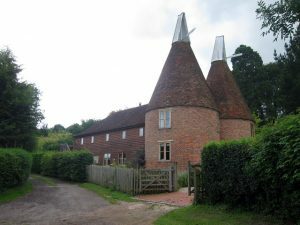 However, we know that Elizabeth moved from Ticehurst to Deal, a distance of over forty miles, so the family may have made other large moves in the interim. The occupation of poulterer gives one pause, considering what we (possibly) know about William’s status later, but no evidence has been found of a different William Brett marrying a woman named Jane before those Deal baptisms. Ages of adults were rounded down to the nearest 5. William could have been 80-84, and Jane 70-74. Both were said to be born in Kent. The parish of Ticehurst is in East Sussex, on the Kent border. There is no record of another William and Jane Brett raising a family in Deal. The occupation of agricultural labourer is a quite a step down from poulterer, but in old age people often suffered a loss of economic status. We do not know who Emma Cox was. We might expect her to be a grandchild, but we have no information about her baptism. By now, Elizabeth was married and living in Deal with her husband Samuel Baker and their sons. It was unusual for people to live into their nineties. But the 1851 census shows a 91-year-old William Brett living in the Eastry Union Workhouse on the night of the 30th March. Many of the inmates are said to be unmarried, but the older ones would in most cases be married or widowed. William’s age, and the fact that he was born in Mayfield, 7 miles from Ticehurst, makes it very likely that this is Elizabeth’s father. William’s birth has not been found in Mayfield. It is possible this was mistakenly entered for Ninfield. Jane is less certainly identified. But she could be the Jane Brett who was a servant in Walmer, looking after two motherless children. Walmer is adjacent to Deal. In this case, her birthplace in Croydon is unexpected, so this may be a different Jane Brett. The census return does show that she was married, and not a widow. If Jane is the servant in Walmer, then she must have found it hard work at 80 to be cleaning, shopping, cooking and looking after the two small Ellender children while their father was at sea. Eastry Union was formed by amalgamating a number of smaller parish workhouses. A new workhouse was built on the south side of Mill Lane in Eastry in 1835-6. In 1836, Deal was among a new group of parishes joining the Union. Its workhouse had been much larger than the others. William Brett was buried in Deal on 17 Feb 1855. He had reached the the surprising age of 95. His address is given as Eastry Union. An example of workhouse rules can be seen in those of Aylesbury. There are two possible death registrations for Jane in the Eastry District. If she was Jane of the Walmer household, then she died in the third quarter of 1858 at the age of 77. If she was not the servant born in Croydon, then her death could also be in the first quarter of 1850.